Blueberries are the essence of summer. In North Carolina blueberries are one of the first fruits of the season. Ripened and ready for picking at the end of May through the hot, humid days of July, fresh plump blueberries will show up in pies, muffins, cakes, sauces, jams, jellies, and even over ice cream. In Eastern North Carolina our locally grown blueberries have been available at small farmer’s markets, roadside stands, and even at our local Piggly Wiggly. Blueberries do not need to be cooked to be enjoyed. My favorite way to eat them is straight from the bush or right out of the container at the farmer’s market! I often buy a pint of blueberries just to keep in the fridge so that I can take a few out for a snack whenever I need something sweet. Blueberries are of course naturally sweet and have an abundance of heart healthy benefits, especially from the antioxidant rich dye in the skin. 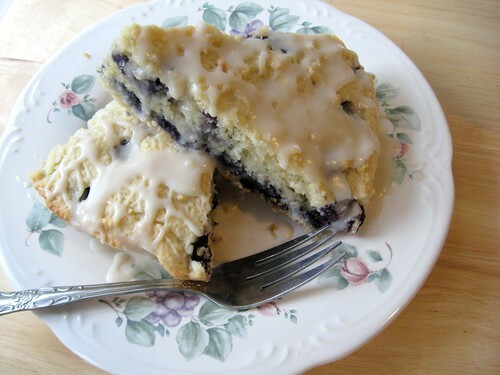 I created the following recipe for vanilla blueberry scones when I received information on a blog recipe contest sponsored by the US Highbush Blueberry Council. I have to admit as much as I would love to be a savory chef, I am a baker at heart… so I decided to create a gluten free, casein free, and soy free scone with blueberries. I chose to use almond flour as my main gluten free flour in this recipe because it is lower in simple carbohydrates than most gluten free flours. If you have not used almond flour in your gluten free baking, I highly recommend it. While it is more expensive than most flours, it’s healthier for you, holds up incredibly well in baking, and is an easy replacement for wheat flour. I am very pleased with this recipe and I hope you will enjoy it. 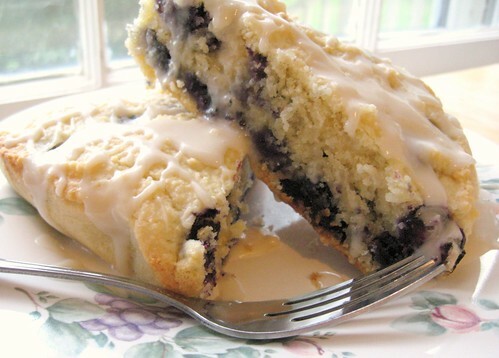 If you are fond of blueberries please give this recipe a try and cross your fingers that the folks at the US Highbush Blueberry Council will enjoy these scones as well! Preheat oven to 350 degrees. Line a 9” cake pan with parchment paper and spritz with non-stick cooking spray. Set parchment lined pan aside. In a large bowl whisk together almond flour, cornstarch, salt, baking powder, and sugar. Using a fork and knife or a pastry cutter, cut Spectrum shortening evenly into the flour mixture until it resembles small peas. Set aside. In a small bowl mix together the whisked egg, non-dairy milk, and vanilla extract. Mix wet ingredients with dry ingredients until thoroughly incorporated. Lastly add blueberries and mix. Batter will be thick. Pour batter into the parchment lined cake pan and smooth with a spatula. Bake for 25-30 minutes until edges of the round scone are golden brown and a toothpick inserted in the middle comes out mostly clean with few crumbs. ** (See notes below on why this baking method is used for these scones. )** When scone is done, remove from oven and set aside to cool for several minutes. Cut round scone into 8 triangular scones. Serve warm with your favorite vanilla glaze. *I used Spectrum shortening in this recipe because it is casein (dairy) free and soy free. Feel free to use another type of shortening or butter in this recipe if you choose to do so! *I used hemp milk in this recipe, because it is my favorite non-dairy soy-free milk. Feel free to use regular milk or the non-dairy milk of your choice. *Almond flour - I purchase almond flour directly from Honeyville Food Products. Different brands of almond flour can vary in consistency and quality and the Honeyville brand is the best I have found so far and has the best baking results. It is also the least expensive in quantity and shipping than I have found elsewhere. For more recipes using Honeyville almond flour, visit Elana's Pantry, where I first learned about this fantastic product. *Traditional scones are created and baked in triangles. This particular scone batter made with almond flour will not bake well in the free form of a triangle on a baking sheet; therefore the batter is made as a large cake and then cut into scone triangles upon cooling. *Glaze – I made a simple vanilla glaze mixing powdered sugar, hemp milk, and vanilla extract until I had the consistency needed for drizzling. Don't miss a single recipe from Ginger Lemon Girl! I cannot not wait to get home now so that I can make these. I love blueberry scones but have not had one since trying to stay gluten free. Thanks! Thanks so much Christina!! I hope you enjoy them!! ;-) I have to admit I am excited about these, the biscuity/sconey texture of this recipe is perfect! I can't wait to make another version for biscuits with almond flour!! I think they are best warm, so when serving the leftovers, I would heat them slightly in the microwave before serving! These look incredible. I may just have to make these in a couple weeks when I have house guests. If I can wait that long! Thanks for sharing the recipe. Yum! I love blueberries, and these look amazing. I love the simplicity of this recipe - Good Luck with the contest! We Southern NC gals love our blueberries! Last weekend my hubby and I picked 10 quarts from my parent's bushes that have grown about 11 feet high. I have been making scones and pancakes with them. Good luck in the contest! These look delicious...just wish I could eat almonds so I could try them, too. These look so good, much moister than a traditional scone. I was wondering about your opinion about almond flour versus a gluten-free blend - what do you think the pros and cons are of each? Amy -- With this recipe in particular a regular gluten free flour blend wouldn't yield the same results, almond flour works VERY differently than a gluten free flour blend which is much drier and has less protein and fat. In this recipe in particular I wouldn't substitute a gluten free flour blend for the almond flour, but in general baking I enjoy using both! I like having AP GF flour blends at home for use. My basic blend is brown rice, sorghum, and tapioca starch which I really think works well in most recipes. Carrie, I've read this recipe through a few time and for the life of me can't see where you combine the batter with the dry ingredients and when the blueberries are added! Please can you clarify so I can make this with friends in Lille next week? Thanks ever so. Abby -- thank you! that means a lot to me! i wish i had your photogrqaphy skills!! you are amazing! CW -- THANK YOU for letting me know! I didn't realize that had been left out of the instructions! They have been corrected! You simply add the wet ingredients to the dry ingredients, stir together and then add the blueberries and stir to mix! So sorry for leaving these out to begin with. Let me know how they come out for you!! I just made these! I didn't have enough for the full 3 cups of almond flour so I substituted with 2 cups almond meal (heard that is the same as almond flour...is that right?) and 1 cup sorghum flour. I followed the rest of the recipe as is, but I was able to bake them like a drop biscuit type scone. We loved them and they are gone! Cooperkelly4 - Thank you so much for commenting!! I'm so glad you made the scones and I'm thrilled you enjoyed them! Actually almond meal is different from almond flour! (BUT if it worked in your recipe that's all that mattered!!!) But for clarification almond meal is usually unblanched almonds that have been ground with the skin and all and usually it is less finely ground than almond flour. But your substitions sound they like they did the job perfectly! thanks so much for sharing your results!! This recipe looks fabulous. What size pan did you use for baking? 9x13 or something smaller? Thank you so much. I can't wait to try this for my family. cooperkelly4 - THANK YOU!! I can't wait to see what else you try!! I love those cupcakes too!! Mmmmm!! OH Carrie, those look wonderful. I love using almond flour! Must try these. My mom has been diagnosed as casein intolerant now! Those look so great, and so simple. Hope all is well with you! OMG those scones look fabulous! Impossible to believe from looking at the picture that they are dairy-free and gluten-free. I love that you use almond flour in them. i know it's a little late...but i just made these for my mother who has diabetes and can't eat too many carbs...and i used sugar free chocolate chips and almond slivers as fillers and they just came out of the oven! she said she hadn't had scones in years...and your recipe for low carb scones looked the best! thanks for this wonderful recipe! Sally -- Just had to tell you that this comment made my evening tonight! These scones are probably one of my very favorite posts ever! I'm so glad they turned out well for you and your mom!! That is wonderful!! Thanks so much for commenting! My scones came out too wet in the middle even though knife came out clean and they were in for 30 minutes. Has anyone else had this problem? Hi -- love this recipe. Just put them in the oven. Fingers crossed that they'll turn out well! Even my gluten free friends will enjoy this recipe! This is an older recipe, but I hope I get an answer. Do you recommend a non-dairy milk like the coconut milk that comes in the refrigerated carton (generally lean, low fat non-dairy milks) or full fat (like the coconut milk in a can)? Thanks!! Hope I get an answer- do you recommend lower fat non-dairy milks like coconut milk in the refrigerated carton or higher fat, like coconut milk from a can? Thanks! Foe - I think either would work, I generally use a thicker non-dairy milk like Almond Breeze almond milk for all of my baking! We love (as in are addicted) to this recipe! I'm curious if you think these would freeze well. We love love love this recipe! But, we have recently learned that one of my children cannot tolerate nuts. :( Do you have any recipes for scones with a GF flour blend instead? I can't seem to find any on your site. Thanks!